Daniel Day-Lewis won his second Oscar on Sunday for his role as a vicious early 20th century oil entrepreneur in the drama "There Will Be Blood." Day-Lewis, 50, has swept this year's awards season with a performance that dominates the screen as an ambitious oil explorer with a sadistic streak. It was the second Oscar best actor win for the London-born actor following his Academy Award for playing a man with cerebral palsy who learns to write and paint with his foot in the 1989 movie "My Left Foot: The Story of Christy Brown." He was nominated for an Oscar two other times for "In the Name of the Father" and "Gangs of New York." Tall, dark and thoughtful, Day-Lewis is known for his intense preparation for his roles. 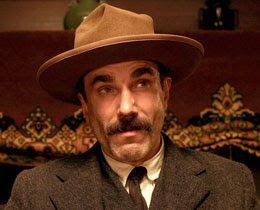 He took four years working on his character with "There Will Be Blood" director Paul Thomas Anderson and has said he could spend 10 years making a movie if a part really interested him. Day-Lewis has dual Irish and British citizenship. He has three sons, one with French actress Isabelle Adjani and two boys with Rebecca Miller, the daughter of the late U.S. playwright Arthur Miller. hi sis, mahilig ka rin pala sa entertainment..hehehe..btw, you've been tagged. you can view it here. hehe..